What was the genesis of this title? Did you pitch Marvel or did they approach you? 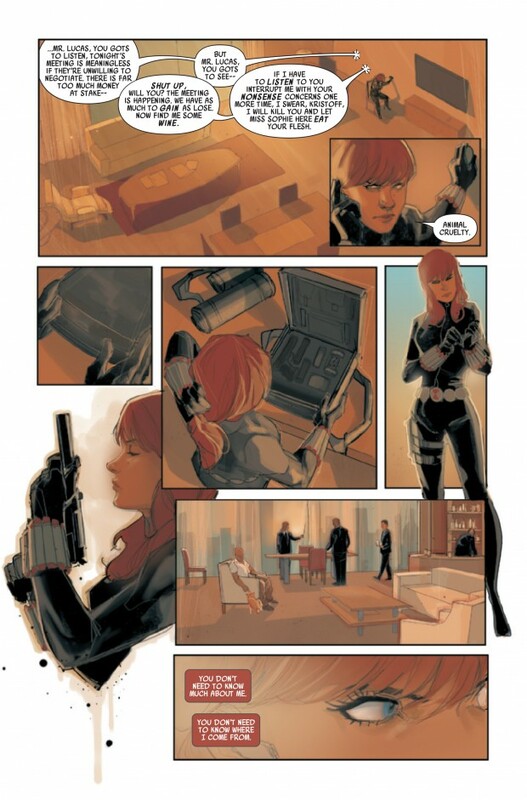 (Marvel Editor-in-Chief) Axel Alonso came to me with an idea — a Black Widow book with Phil Noto that allowed Phil and me to just be creators, to let our chemistry create something truly special. This spoke to me on every level and I think the recipe has come out of the oven just right! 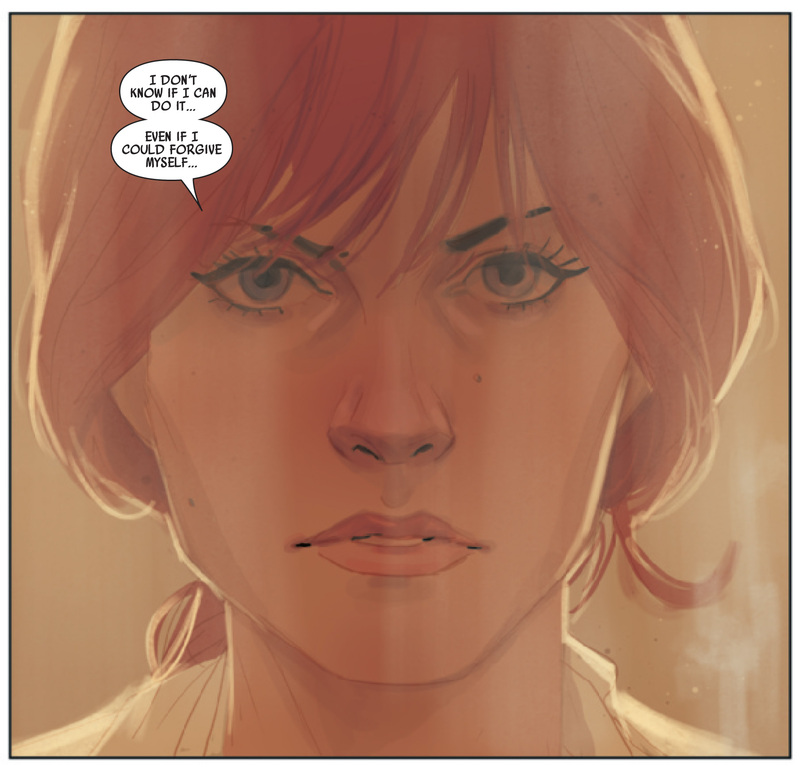 You couldn’t find a more pitch-perfect artist for the Widow than Phil Noto. What was your reaction when you found out you would be working with him? Exactly as you put it. I love Phil; he’s a great person and a wonderful artist and he’s born to illustrate this book. I couldn’t have been more enthusiastic at hearing his name. Describe your process with him? Do you find yourself changing your process in order to play to his strengths? I didn’t have to change much; his versatility is so great that he kind of washes over the script like an art river. I just put some words there and hope his art picks them up on the way. I think we work together wonderfully well, our collaboration doesn’t require a lot of nitpicking or discussion. We get each other and the product hits the page just like we both imagine — far better than I do, actually. What aspects of Natasha’s character speaks to you? Her intelligence and self-flagellation are what make her most attractive to me as her writer. What is Natasha’s place in a world filled with gods, monsters, and mutants? She has a specific and vital role amongst the techno-heroes, Gods of Asgard and Gamma-irradiated beasts; she’s the silent weapon and the deceiver. She can do in the shadows what other heroes can’t risk in the cameras. Does anything happening in Marvel films or Marvel television inform your direction or your characterization of Natasha? Not officially, but we do try to be mindful that we create a Marvel book that doesn’t seem alien to readers who come looking for it after leaving the theater. Any stories from Marvel’s past inspiring your direction? Yes and no. We stand on the shoulders of giants and Natasha is a character with an endlessly fascinating and terrifying past. The films have only added to her stardom and mystique, throwing ever more a spotlight on her. At the end of the day, though, we embraced her as we knew her and set out to tell a story that was all our own and with all our own aesthetic. I think we pulled it off, and it couldn’t feel better. What heroes or villains can fans look forward to seeing you and Noto take a crack at? Look forward to us adding a few new names to the canon, but as the story goes on we’ll meet more and more familiar faces. The first six issues we set out to show her isolation, her loneliness and self-reliance and we didn’t want to distract from that with a rogues gallery of old friends and lovers, nor did we want this book to succeed only because Cap or Thor was on the cover with her. It’s her book, her story, her world and that’s the first, most important thing. 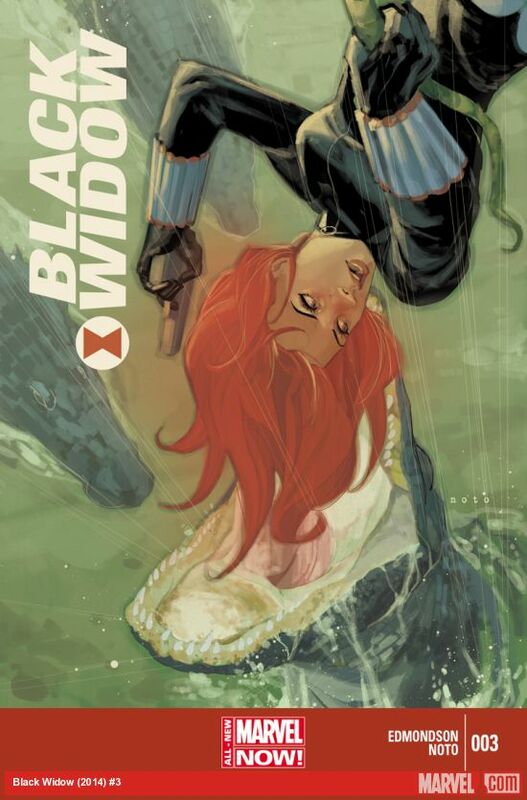 What non-comic works or authors inspire your work on Black Widow? Interesting question. Le Carre, Ludlum, Joseph Conrad, Michael Crichton and Brad Thor all certainly have come along for the ride but it’s hard for me to identify any specific directions I’ve taken from any of them. 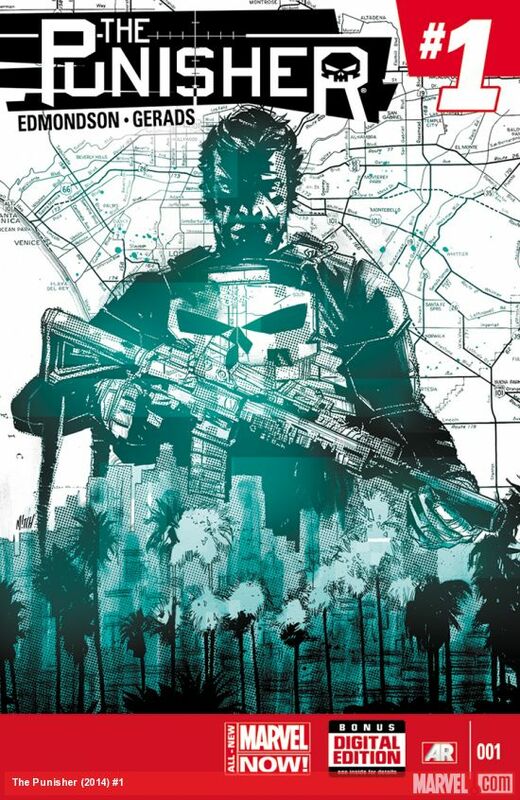 Edmondson’s other big, new title, The Punisher, is also out Wednesday. Got a comment? Leave a comment! Love that Phil Noto art and looking forward to great things with this series! 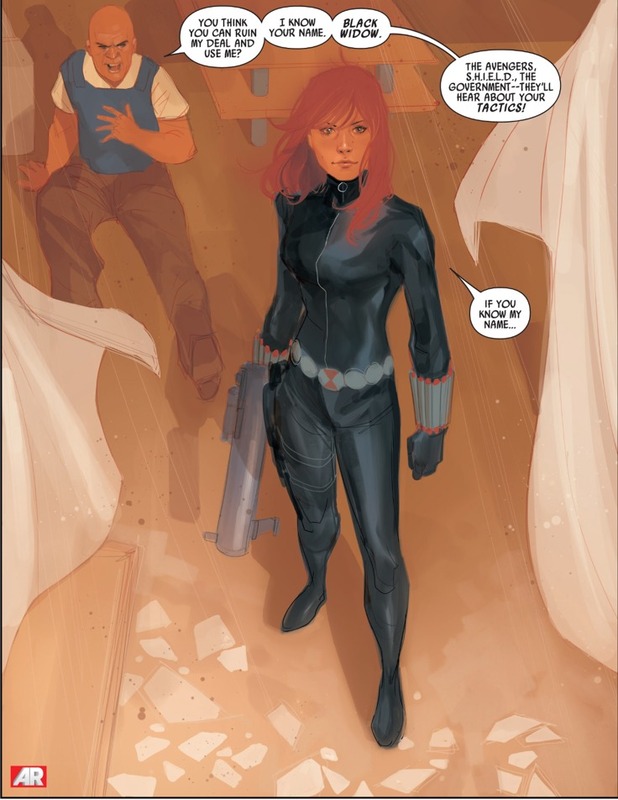 Black Widow has been my personal favorite hero for years, and I can say without hesitation that this incarnation of Natasha has been the most consistent, not to mention the funnest B.W. title released in a very long time.